Notes from the presentation of the book Comunicación móvil y desarrollo económico y social en América Latina , by Mireia Fernández-Ardèvol, Hernán Galperin and Manuel Castells, M., that took place at the Internet Interdisciplinary Institute, Barcelona, on September 28, 2011. There are few technologies, if any, that have been so quickly adopted as Information and Communication Technologies, in general, and mobile telephony, in particular. And it is very worth noting that this adoption has not happened in the same way around the globe. Different regions, cultures, communities have and are using mobile telephony in many and very different ways. Thus the need to do thorough research in this field, and see how mobile telephony can empower and develop communities and individuals. Manuel Castells, sociologist, director of the Internet Interdisciplinary Institute of the Universitat Oberta de Catalunya (UOC) and author of the book. The three things people value the most are Health, Education and the ability to communicate. And if we consider Education as Communication, we can narrow the priorities to just Health and Communication. That is why ICTs are such a powerful phenomenon, with pervasive and fast rates of penetration and adoption. And the more important is a phenomenon, the more the need to perform research on it, to analyse it, understand it and, if needed, affect its path. The book is not a descriptive one, but an analytical one, taking data from Telefónica and CEPAL-ECLAC to be able to perform econometric regressions. There is a proven, statistically significant, systematic, positive effect of mobile phones upon economic growth, especially in poorest countries and especially in poorest regions. Inequality is neither increased nor decreased because of mobile technologies. Mainly because adoption rates are so high (circa 80% in general) that any strata of society does have access to mobile telephony. There is an impact of mobile phones decreasing poverty. A positive impact on employment. As many people work autonomously, thanks to mobile phones they can get jobs/works done without the bounds of more rigid organizational structures. People find employment more quickly thanks to disintermediation of the job market. Increase in security — and the feeling of security — of people: distant communication reduces exposure to different kinds of violence and hazards. There is an increase in the autonomy of people, but at the same time increasing the connectivity amongst people and increasing the feeling of community, of a common identity. But not any autonomy, but “secure autonomy”. If we take the context of schools, it is clear that the educational system is lagging behind the evolution of technology, and educators and policy-makers should definitely rethink their teaching strategies and leverage the power of mobile techonology and mobile (i.e. ubiquitous) access to knowledge [I personally disagree with Castells that laptops at school should be replaced with mobiles: I believe the problem is not the device, but the educational model]. Ismael Peña-López: despite the high rates of adoption and, thus, the lack of impact in quantitative terms on inequality, what happens in qualitative terms? Are we witnessing evidence for the knowledge gap hypothesis? Castells: absolutely. What we see is that technology adoption is not affecting inequality, but social inequality does affect unequal technology adoption (e.g. poors not accessing broadband). Nevertheless, the inequality of mobile adoption, or the inequality in communications, is not as important as socio-economic inequalities, and that is a very important fact. Q: how is it that people spend relatively so much in communications instead of “food”? Castells: the main reason is because it is worth it: mobile phones have an impact on employability, for instance, and very important too, on socialization, which, at its turn, has an impact on employability and inclusion in general. That’s why: communications are of crucial importance nowadays and do have an impact on each and every aspect of our lives. Q: is there a different impact depending on e.g. gender? Castells: there is, but not because of the gender factor, but because the gender factor already made a difference in the “real” world. For instance, in the Peruvian Andes markets are set up by women. Thus, the impact of mobiles on those women was higher than on men, but not because of their gender, but because of their important role on the local economies. The book performs a thorough and deep analysis on how mobile technologies have had an impact on Latin America, both at the economic and social levels. After two initial chapters depicting the framework and context, the book goes on estimating the quantitative impact of mobile telephony on economic growth and poverty alleviation, then moving onto mobile usage in rural areas, social businesses for e-inclusion, technology appropriation and usage among youth. Introduction: Mobile communication and development in Latin America in the XXIst century; Roxana Barrantes Cáceres, Mireia Fernández-Ardèvol, Sebastián Ureta. Socio-economic context and ICT diffusion in Latin America; Mireia Fernández-Ardèvol, Andrea Molinari, Javier Vázquez Grenno. Mobile telephony in rural areas: case study in Puno, Peru; Roxana Barrantes Cáceres, Aileen Agüero, Mireia Fernández-Ardèvol. Mobile telephony and inclusive businesses: Proyecto SUMA in Argentina; Hernán Galperin, Andrea Molinari. Appropriation and usage: case study in Brasil; François Bar, Francis Pisani, Carlos Seabra. Mobile youth culture in an urban environmetn: case study in Santiago de Chile; Sebastián Ureta, Alejandro Artopoulos, Wilson Muñoz, Pamela Jorquera. Synthesis of results and conclusions; Manuel Castells, Mireia Fernández-Ardèvol, Hernán Galperin. Project to analyze mobile telephone usage in Latin America. Diffussion or mobile penetration, though not as high as higher-income countries, it does have a certain level of penetration that sometimes almost reaches 100% (higher-income countries reach up to 120%). Penetration is though unevenly distributed. 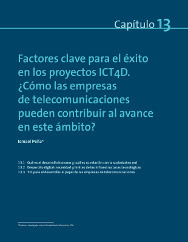 Research question: does mobile communication affects (impacts on) socio-economic development in Latin America? That was a new question in the region of Latin America, and it was relevant and ambitious, and wide, as a whole research network of several people and institutions worked together to answer the research question. The levels of analysis: macro (economics, econometrics, context), meso-organizational (institutions, markets) and micro. It was very important too to maintain a multidisciplinary focus to gather all the shades of meaning of such a complex topic. Case in Puno, poor rural region in Peru, where mobile telephony had been recently introduced, with very low fixed line coverage. Does the diffusion of mobile communications affects welfare? and what is welfare? how are we going to measure it, what indicators are we going to use? Final consumption was used as main indicator, and a comparison was made amongst mobile users vs. non-users. Data were gathered using a survey were the respondents listed their goods or their assets (e.g. “I got a TV set”). Of course income does not equal consumption, but it is easier to trick on income than on consumption. On the other hand, it is true that welfare is not welfare (what about health?) but it was considered as a good proxy. The target communities were articulated through weekly street markets, so people going to the markets were surveyed, using both ethnography and structured surveys. Ethnographic research helped in knowing what was happening, who were the people, how did they think. The structured survey provided the quantitative data to complete the qualitative approach. Results show that mobile phones increased welfare (as measured in the research) in those households where the household head had been using a mobile phone for one year or more. The mobile phone is something that is not extraordinary, it is embedded in everyday’s life and it thus has an impact. Having more information helps you in making better decisions (e.g. go and sell your cheese in another market where prices are higher), but you have to be used to the device, have to be literate in the platform, be using it naturally so that it naturally enters your business, your economic sphere, etc. Social networks are managed through the mobile phone, including both familiar and commercial networks. It is an appropriation process that improves well-established habits.